I honestly have no idea what purpose these quotes are supposed to serve. If they were there for emphasis (as incorrect as that is), they should be around the word ‘no’. Is pseudo-trash the disallowed commodity? Who knows! 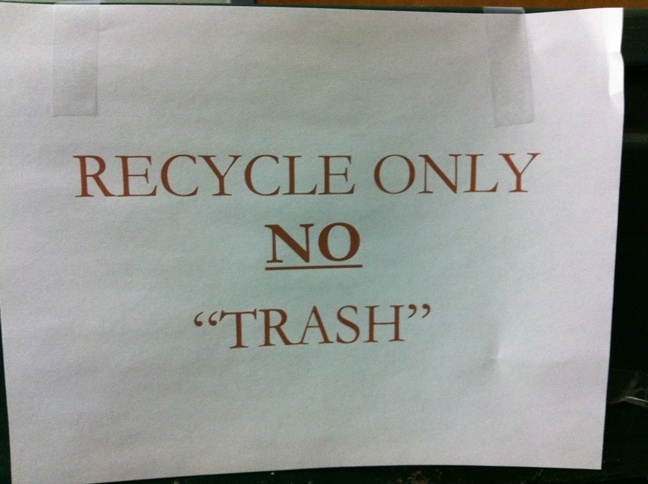 Maybe the author is a hard-core environmentalist who believes that most of the material we consider refuse could actually be repurposed or otherwise have value, but acknowledges that it cannot, in fact, be recycled by this community’s recycling facilities?